Report claims Israel carrying out secret talks with banished Fatah terrorist Mohammed Dahlan, anticipating that he will replace Abbas. A report Thursday said that Israel was carrying out secret talks with banished Fatah terrorist Mohammed Dahlan. According to a report in Maariv, Prime Minister Binyamin Netanyahu has dispatched a senior official in the Prime Minister's Office, Yitzchak Molcho, to meet with Dahlan in Dubai, where he absconded to in 2010 when he was thrown out of Ramallah. Dahlan, former security chief for the Palestinan Authority, has often been at odds with the PA leadership. He developed strong contacts in the CIA and with Israeli intelligence officials, and in 2001 upset then-PA and PLO Chairman Yasser Arafat by calling for reforms. According to the report, Israel has decided to renew contacts with Dahlan in preparation for a scenario in which PA chief Mahmoud Abbas steps down because he will refuse to sign an American negotiation framework that would require him to commit to dropping all future claims against Israel, and to recognize Israel as a Jewish state. Dahlan is seen as a leading contender for the post of PA chief. In 2003, newly-appointed PA Prime Minister Mahmoud Abbas re-appointed Dahlan as PA Minister of State for Security, over Arafat’s objections. Within months, both were out of office, frustrated with the level of corruption in the Arafat ranks. Dahlan was accused in the December 2006 attempted assassination of de facto Gaza "Prime Minister", Hamas leader Ismail Haniyeh, as he crossed the border into Egypt, although Dahlan rejected the charges. In January 2007, he led a Fatah rally in Gaza, calling Hamas “a bunch of murderers and thieves.” By July 2007, after Fatah was ousted by Hamas from Gaza, Dahlan resigned his post as PA national security adviser – a formality, since Abbas had dissolved the “national security council” by that time. 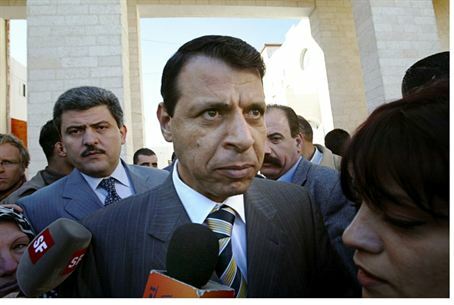 In July 2011, Dahlan was expelled from Fatah due to allegations that he had murdered Arafat, who had died in 2004. PA police raided his home, and his private armed guards were arrested. In June 2012, investigators claimed they had found traces of the radioactive element polonium – a poison – on Arafat’s belongings, increasing suspicions he had died of poisoning. Those claims have since been debunked, as numerous independent studies have proven Arafat died of natural causes - though that fact has not ended the popular conspiracy theories within the Arab world, branded by Israel as "pure fiction", that Israel colluded with Arafat's rivals to assassinate him.